Formula 707® LifeCare® Daily Essentials is now available in Daily Fresh Packs! Achieve superior health and condition in horses of all ages. 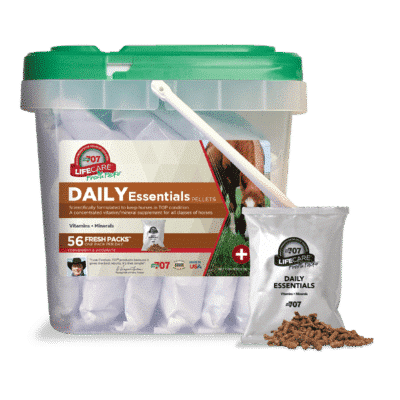 COMPLETE vitamins and minerals ensure your horse gets everything it needs to remain sound and healthy. Proteinated trace minerals are designed to survive the digestive process and maximize absorption. Palatable, oat-sized pellets are designed for easy feeding without waste.